All engines suffer from accelerated wear as a result of periodic dry starts - especially today's high performance, fast starting diesels; and the larger the engine, the more significant the cost. Dry starts can occur in very cold weather, very hot climates, after prolonged shut-downs, or following routine oil changes. Use of the engine prelube system will significantly reduce key engine component wear resulting in considerably longer engine life and lower operating costs. This has important implications for single shift operations, for marine and prime power and industrial applications where engines are operated for less than 2000 hours per year. Automatically Wired: Simply turn the machine's existing start switch to the "start" position and the prelube starter will automatically pressurize the engine with oil pressure. Beyond significantly reducing engine wear, the engine prelube system is the only such system that ensures oil pressure is built before the engine can crank. If an engine lacks oil, the prelube system keeps it from starting, preventing catastrophic damage. The system can be used as an effective diagnostic tool to help detect fuel and/or glycol dilution. It can also be used to widen the effective temperature operating bands for 15w40 oils whose low end temperature spec normally is +5F. Where temperatures fall below the +5F threshold, the prelube system will ensure oil pressure and flow BEFORE engine cranking can begin. Should someone forget to put oil in an engine, the Prelube system will not even allow the engine to begin cranking - a nice added benefit that means added protection. 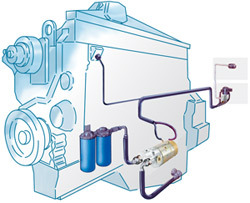 Even remote-mount oil filters pose no problem as the Prelube system automatically , safely and quickly fills filters and all oil passages prior to cranking - every time the engine starts. In all of these situations, the engine Prelube system will significantly reduce engine wear and help to lower your operating costs per hour. For more information about engine prelube systems, call 800.255.2250 or contact us today!